Our personalized gift cutting boards make a great item for a Christmas gift, Birthdays, Housewarming, Hostess or just about any other gift giving occasion. Holding true to the original spirit of ETSY, we still make all of our cutting boards one board at a time using locally sourced hardwoods! 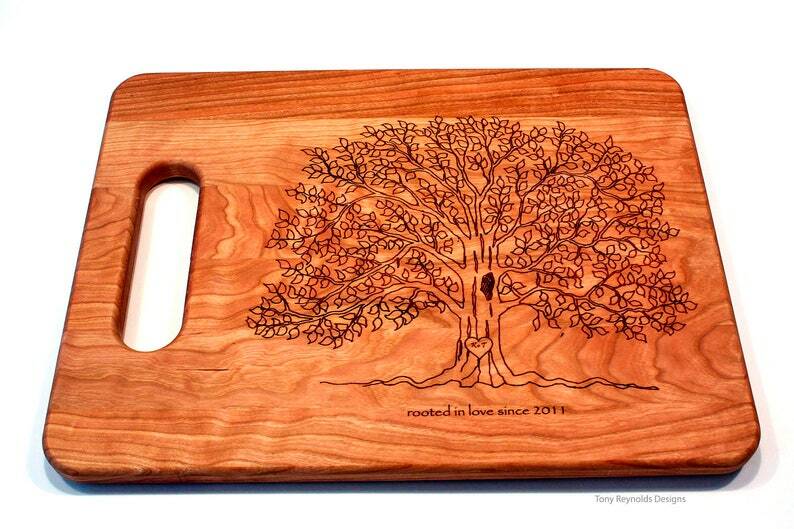 This personalized gift engraved handled cutting board is highlighted by a beautiful tree drawn by Kathy. Personalize your board with Initials engraved into the heart on the trunk of the tree and the year of choice in the text below the tree roots. We engrave the front of the board to allow it to be displayed when not in use. The back is left blank for use as a cutting / chopping board. Please tell us in the "Notes from Buyer" section during checkout, what initials you want engraved I.E. K+T and the year I.E. 2011 for the text line.